The trend for the major indexes are still down in the shorter time frames. Although they are nearing support areas, it will be most unwise to enter stocks yet till the situation stabilizes. Each day we need to analyze the 3 main indexes to spot any trend reversals. Join me on this journey in figuring out what the Dow, S&P 500 and Nasdaq is trying to do. The latest analysis will be on top. Everyday I will try to update the analysis. So please come back and press the refresh button on your browser. Please forgive me for any spelling or grammar mistakes. I am writing this analysis very fast so might not have time to spell check. As long as you understand the analysis I think you will be fine. Today is the first day of Chinese New Year and many markets are closed for the holidays. 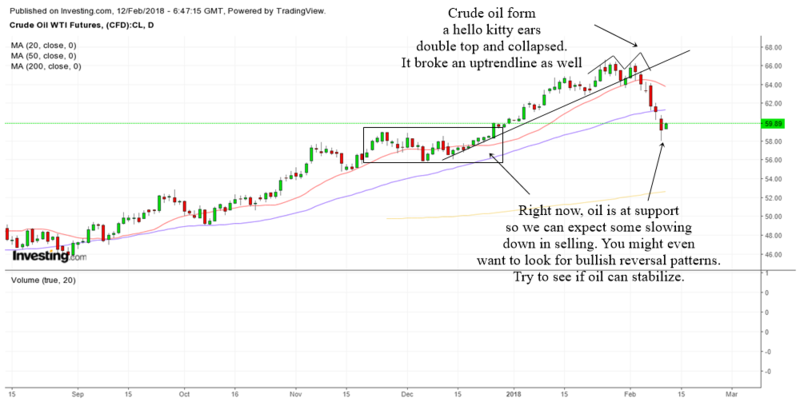 The US market is still open and the recent new short term uptrend is really bringing back prosperity to market participants who are able to catch the bottom of the sell off. Those of you who are regular readers of my analysis will also know that we have been able to identify the bottom of the plunge. I am truly delighted to take you on this journey to discover each day what the stock market in US is likely to do. It is of utmost importance for us to study the US market because 75% of stocks follow the main indices. Besides that, most stock markets around the world also follow the direction of the US market. You just have to look at the charts of other markets to see the similarities in the plunge. There is no isolated markets today in the connected world. The chart above is the 2 hour chart of the Dow. I usually like to use the 60 min chart to study the indices. 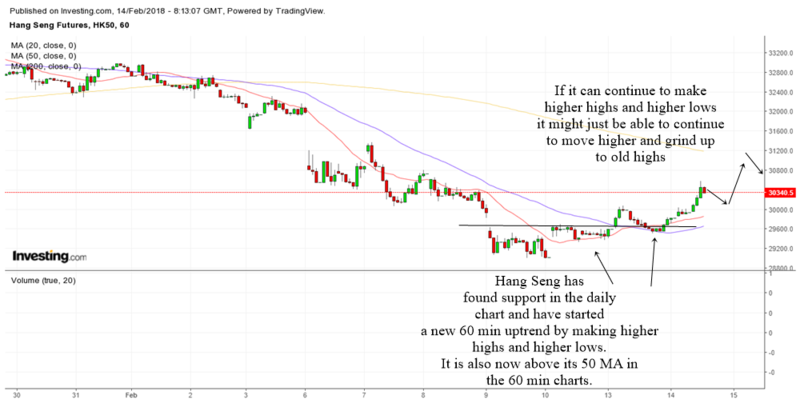 But I'm showing you this 2 hour chart so that you can see the overhead resistance. Serious resistance for the Dow is still a bit far away. So you should expect Dow to continue to climb higher. As long as Dow stays above the rising 20 MA, then you should remain bullish on it. This is a very simple trend following method that works very well. The resistance area will be around the 26000 area. But if Dow manages to trade sideways a bit as it hits that area, then most supply will be absorbs and the markets can go higher from there. I won't be surprised if the Dow notch another record highs soon. The chart above shows us the 60 min chart of the S&P 500 futures. As you can see, there is quite a lot of layers of support beneath as the new short term uptrend starts. These few days has been very good days for those who are swing trading to the long side. 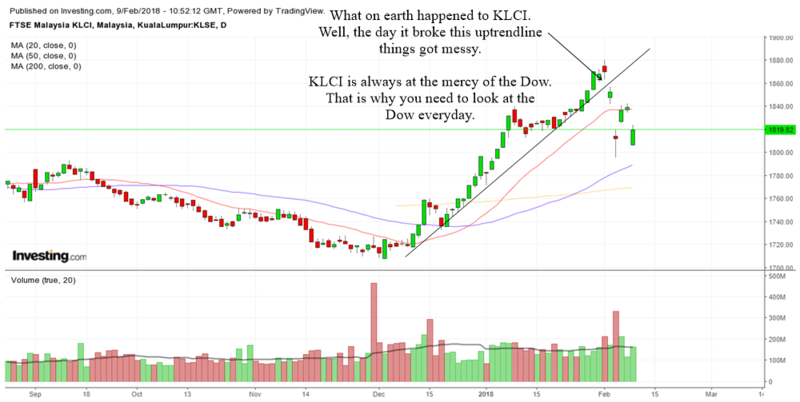 When the stock market's trend is up, you should long stocks and ride the trend higher. Currently, the 20 MA and 50 MA are rising nicely in a railroad track fashion. As long as S&P 500 stays above the rising 50 MA we should continue to remain bullish on the markets. If you have look at the 3 major indices, you would have realized that the Nasdaq is much more stronger than the S&P 500 or the Dow. This is called market leadership. When techs leads the market after a sell off, the is indeed a very good sign for the stock market to continue to go higher. There is support below, however, there is resistance overhead as well. This should not be a problem for the markets as long as the Nasdaq trades sideways as it reaches that area. 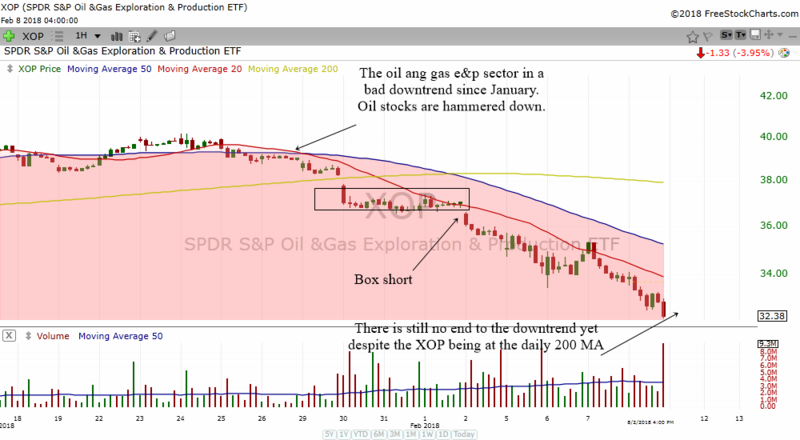 The sideways trading will help to absorb the supply there. Stay bullish as long as the Nasdaq stays above the rising 50 MA. Things are going to be quite busy for me these 2 days as Chinese New Year is approaching. But I think I might just be able to squeeze in some time to update stuff here and there. The SPX has stage quite a nice bounce back up. The index has managed to make a double bottom at support area. Notice the bottoming tail before it shoot up? That was a sell off before it shoot back up. 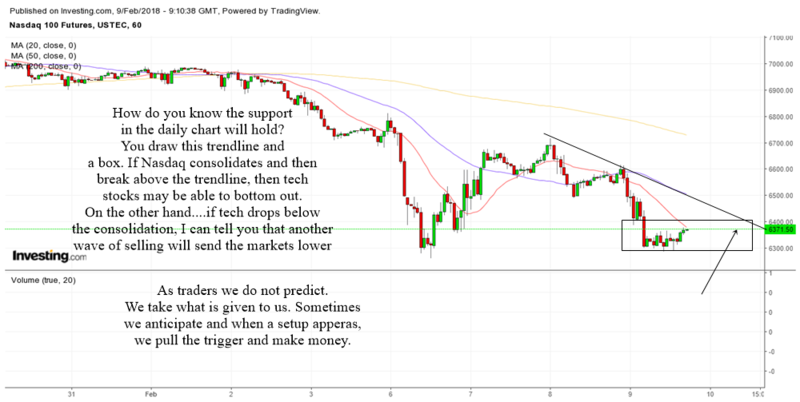 That is why support areas and chart patterns are so important to help us spot important turning points in the market. At this moment, the SPX is trading right up to the downtrendline resistance in SPX. It is also where it will most probably meet the 50 MA which may provide a little psychological resistance to it. Some may see a bearish cross about to happen and that will perhaps caused some problems. But what we can anticipate is perhaps SPX may form a cup with handle in the daily chart. If this happen, then we may be in for another explosive run up later. 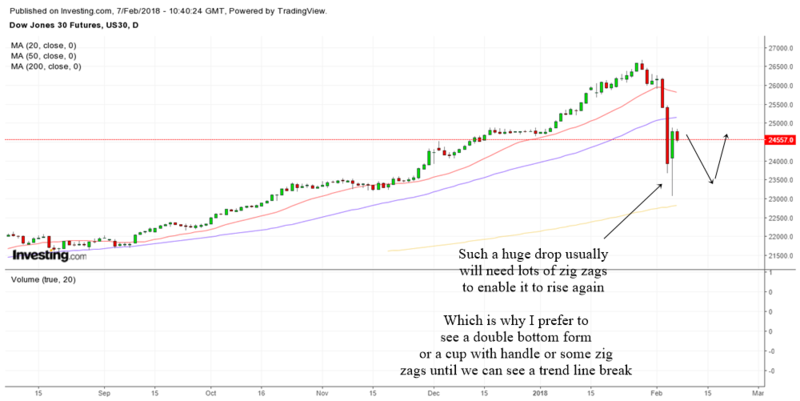 That's because cup with handle patterns can often give us a nice bull run up when it appears in charts of stocks or indexes. Traders can also buy the breakout of the cup's handle. 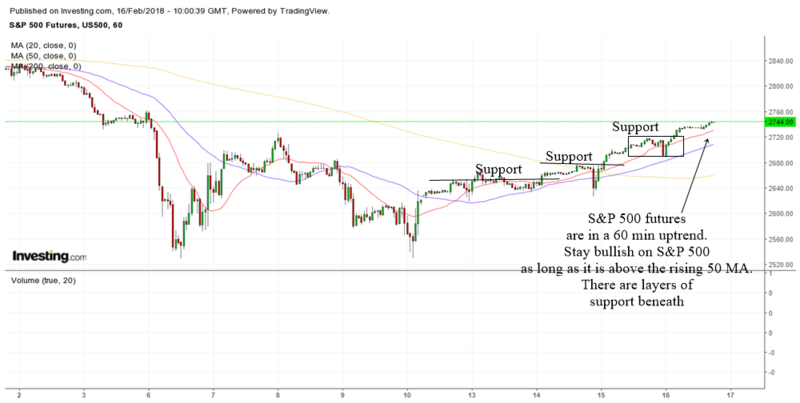 We do not really know what will happen to SPX but a closer look at the 60 min charts and a continuous bar by bar analysis will help us to anticipate better. 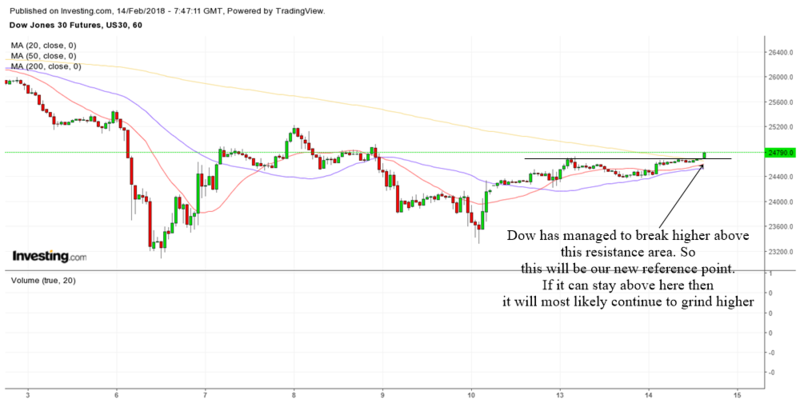 The chart above is the 60 min chart of the Dow. It has broken out of a trading range and this is something good. As long as it stays above this trading range, then it will most likely grind higher. We had a nasty 200 point drop yesterday before the open because of inflation fears but the support hold and it bounce back up quite fast. 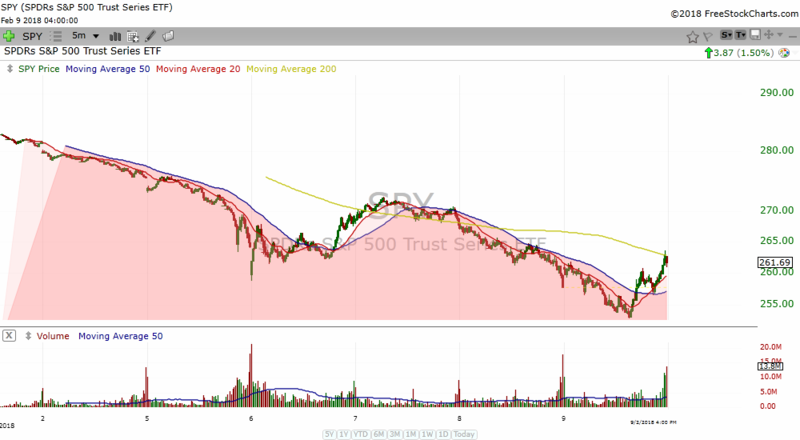 The SPY has now broken out of what I call a 60 min bullish cross box breakout. Usually we can take the measured move and project it upwards. This is also where it will probably meet the 60 min 200 MA and the downtrend line. So be on the lookout for these areas as some resistance as it reaches there. 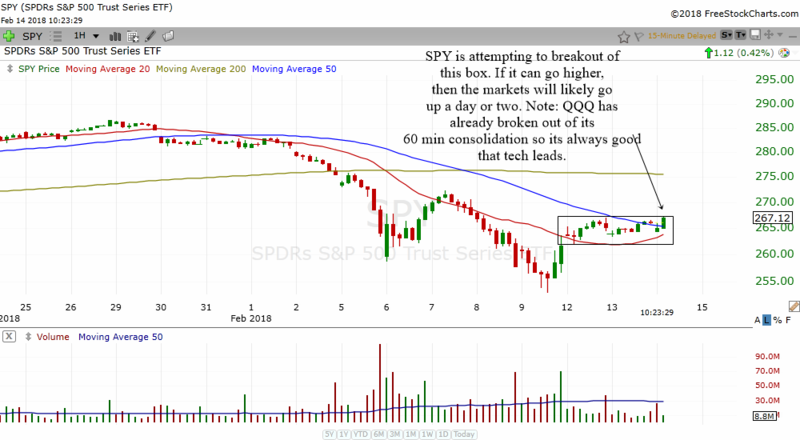 As long as SPY stays above the box, we can be sure that the stock market is on the road to recovery. Perhaps it may grind higher but the SPY is definitely trying to start a 60 min uptrend. Once again I'm quite busy and unable to post anything here daily for the US market analysis. However, I do post in the Telegram Premium Channel. So the below are the stuff that I posted there. I still feel that social media like Telegram or stocktwits are the best for up to date information. 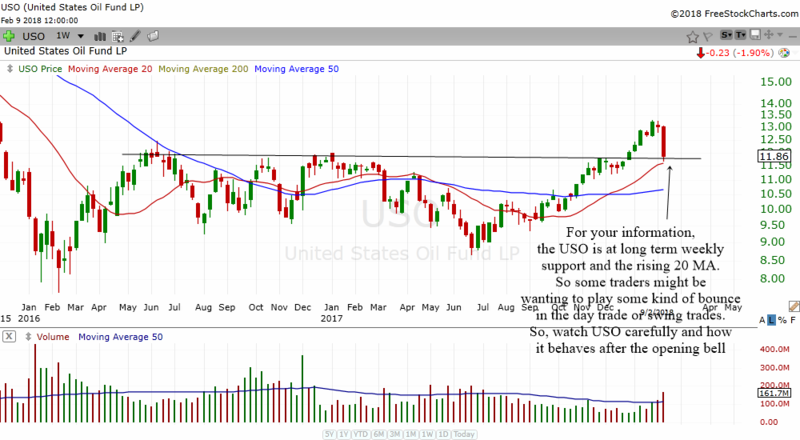 Websites can be beneficial but mostly to those using daily charts and above. What a volatile trading environment that we had. In these times, it is the day traders that will make a lot of money. But it takes a lot of skill to be able to pull money out of the markets. The stock market may be green one day and then it will be red one day. 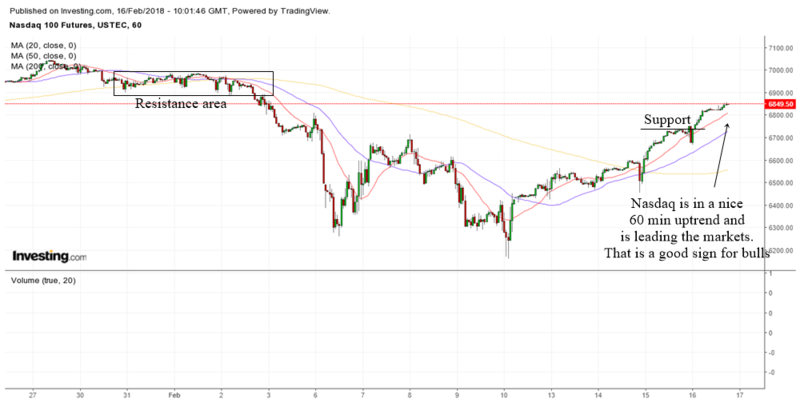 Well the reason is because we are no longer in a nice trending up environment in the daily chart and 60 min chart of Dow and S&P 500. That is why buy and hold will usually suffer a lot. While there is no trend in the bigger time frames, you can usually find a nice bull or bear trend in the 5 min charts. That is why the day trader will be king in these times. Just like cash is king when the economy is bad. As you can see in the daily chart of Dow above, we are still in a very choppy environment. I expect this to continue perhaps until the Dow meet its rising 200 MA. 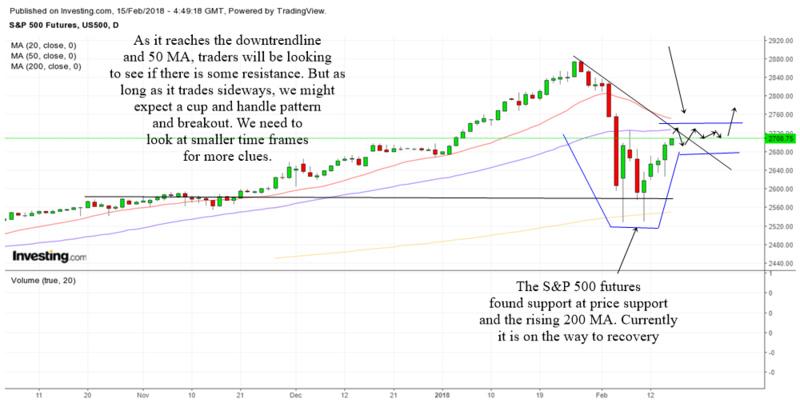 Therefore, your attention should focus on the smaller time frames to catch the smaller bull and bear trends. If you are new in the market and do not know of any day trading strategies, then I suggest that you watch the market from the sidelines. 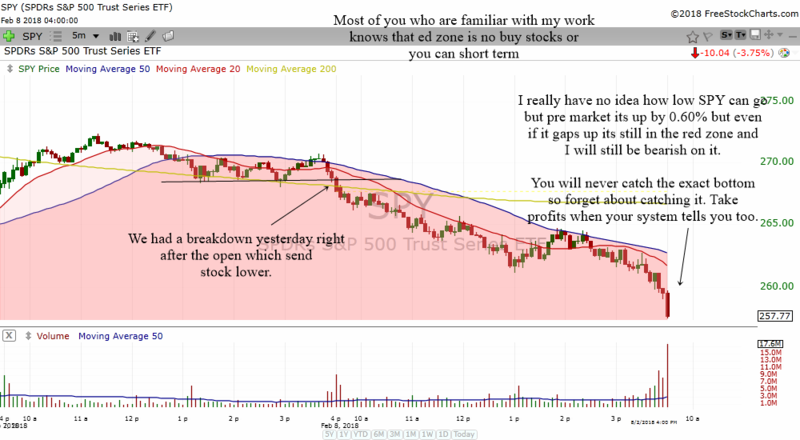 Or better still, do some paper trades in a practice account to have a feel of how to trade in this kind of environment. 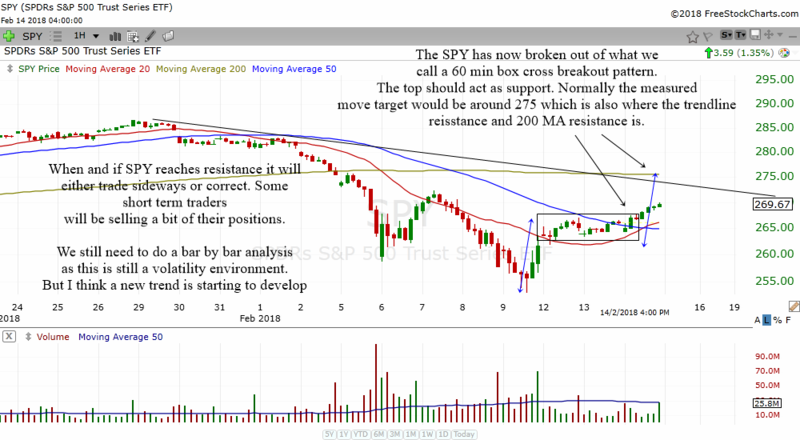 The chart above shows the 5 min chart of SPY. The trading rules that we follow here in Dstockmarket is this. 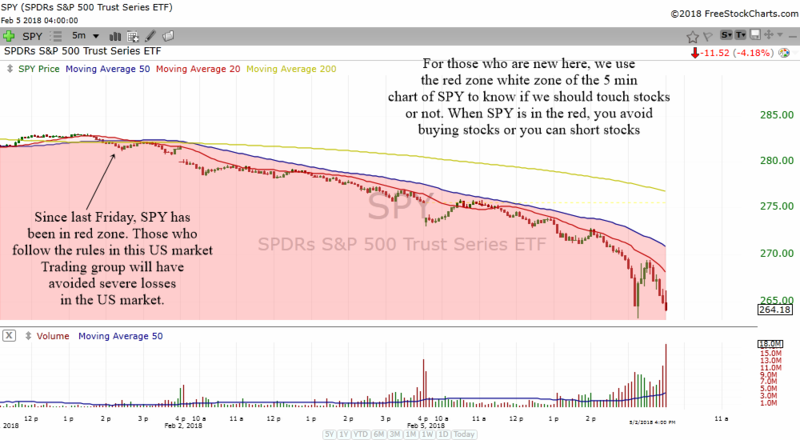 If the SPY is in the red zone then we avoid buying stocks. If the SPY is in the white zone then its ok to buy stocks. This is so that we are always in the right trend. This may not be perfect but you will be on the right side most of the time. Entry and exits should be based on some sound day trading strategies. 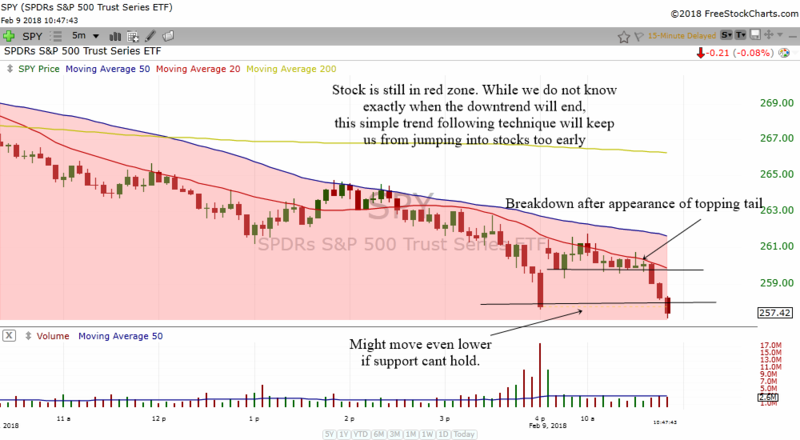 Currently SPY is dropping back below into the red zone and this calls for caution. You should try not to touch stocks on the long side when it is in the red zone. Some may choose to short stocks. 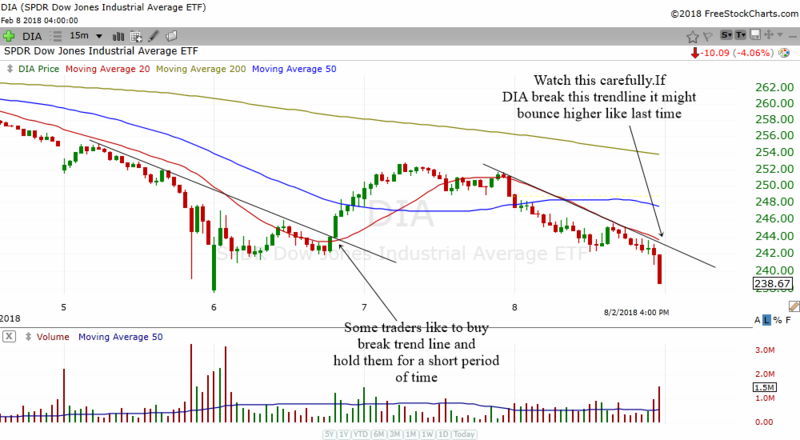 The chart above is the 60 min chart of DIA. As you can see, it is very overbought in the 60 min chart. The stochastics is flashing a sell signal and the MACD histogram is shortening telling us a slowing down in buying momentum. 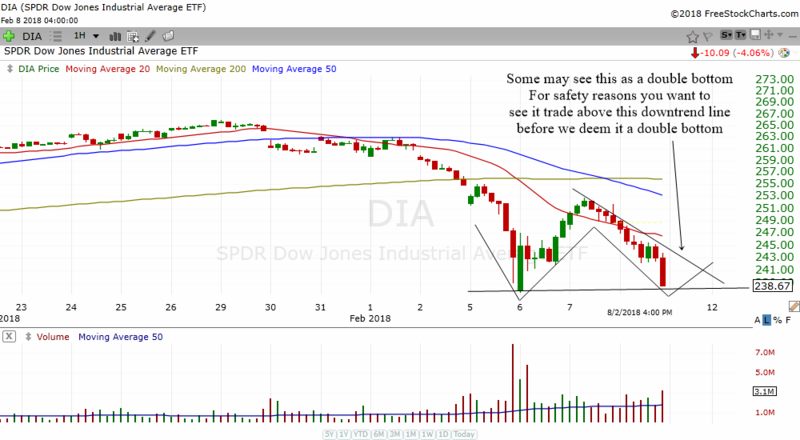 Which is why we need to look at the 5 min chart of DIA when the market opens. 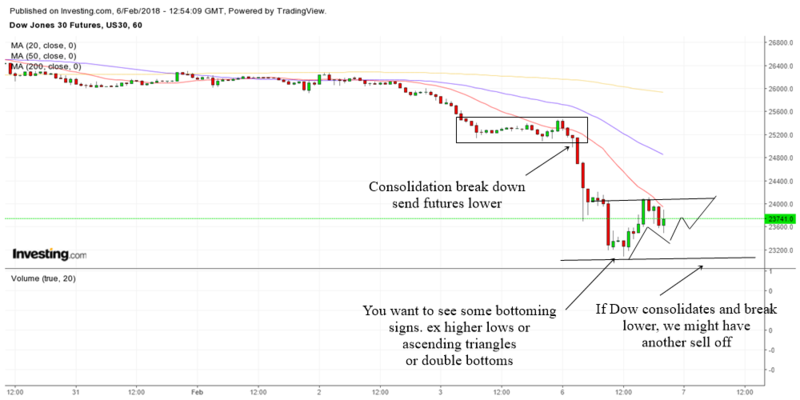 If selling happens, that is a good thing as the whole 60 min chart might form a triple bottom of a reverse head and shoulders pattern. That is what we anticipate but we will only know what it does after the opening bell. I did not have much time to put everything here on Monday. The charts below are what I posted in the Premium Channel. Premium channel members get a lot more as I update things live. I'm sorry once again for the late entry here as I was busy with something. But I have included the analysis below with lots of charts. They are from my Premium Telegram Group Channel where I share updates and things about the financial markets live as it happens. 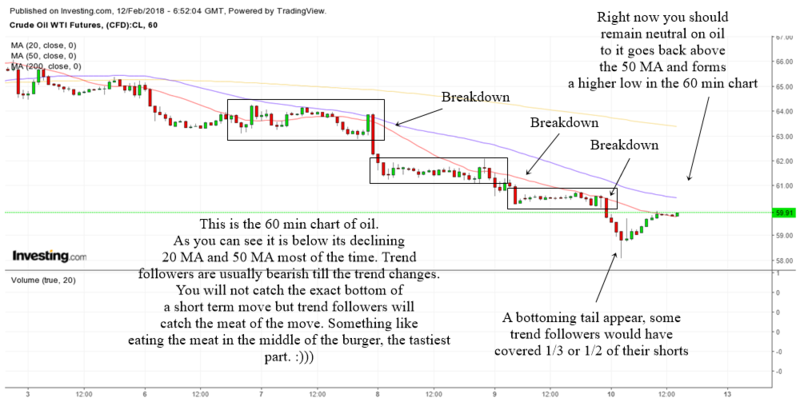 Sometimes writing things down here are more useful for longer term perspective because things don't happen as fast as in the 60 min charts or the 5 min charts. But anyway I still will put them here so at least you can study them if you are free. Ya, one of the things I would like to tell you is that as a trader you should not predict. You should take what is given to you. If a very familiar pattern happens in the stock market and you are confident about it, you can take the trade. Try to anticipate rather than predict. Those who like to predict will have a tendency to stick with their wrong predictions because of their ego and lose money trying to justify that their decisions are correct. For Malaysians who are stuck in their position in Malaysia when the Dow starts to crack, you can actually hedge your Malaysian positions using the EWM which is listed in US. EWM is Malaysia's country etf. Today there are all kinds of etf's available which you can utilize to long or short. As you can see, EWM entered into the red zone and become very very bearish. 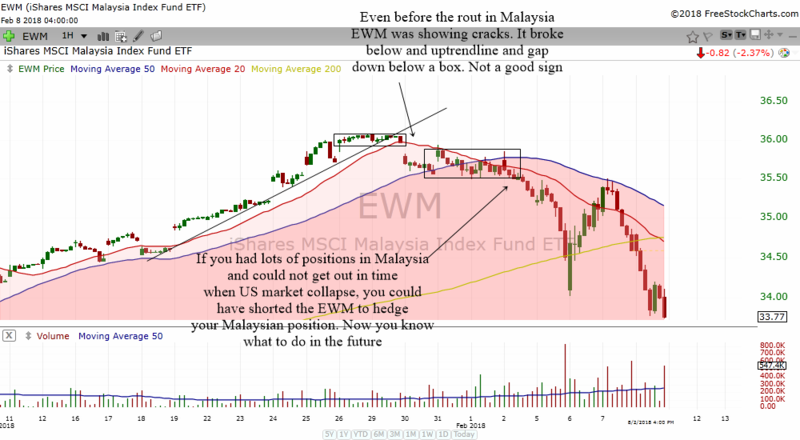 The volatility in the Malaysian market can be hedge by shorting EWM or buying a put option on EWM. I am actually updating this a bit late. So my apologies to those who are not in my Telegram Group where I post an update fast now and then. You can find the link to the Telegram Group below. 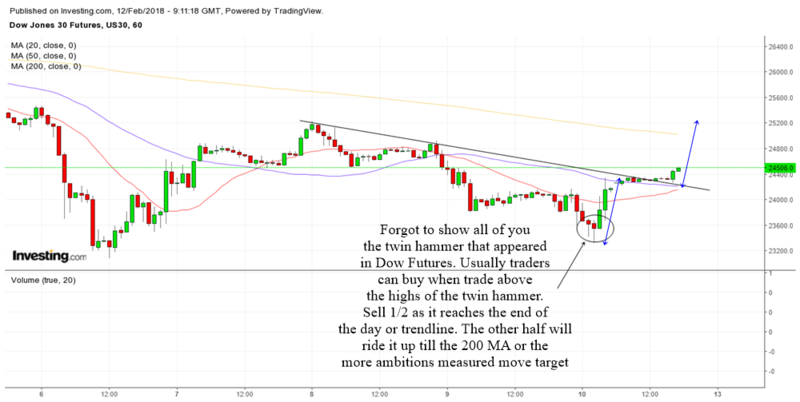 The above is the 60 min chart of the Dow Futures. As you can see the Dow has broken an uptrend line. Not something to be worried at all but what you need to worry is the Dow breaking below the head and shoulder pattern in the 60 min chart. If Dow continues to break lower this pattern then there will be some selling down perhaps even to the previous lows. I don't know but at least the break down areas give us a reference point. This is the 5 min chart of QQQ. 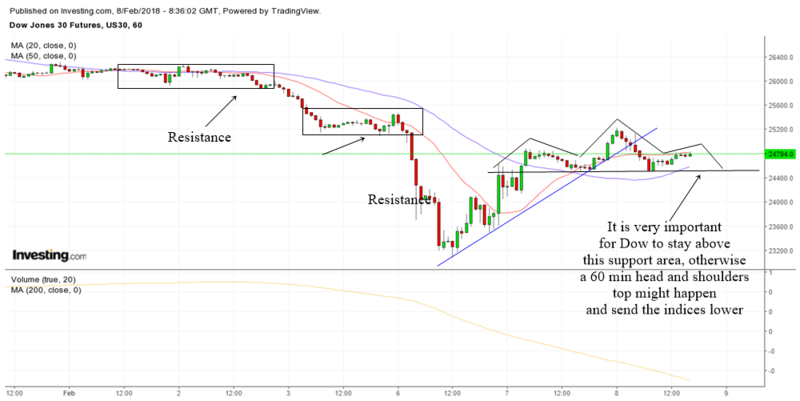 This is the system that we use in US Market Trading to know when it is conducive and when it is not conducive to enter stocks based on the intraday chart. As you can see, stock started to move higher once it went back above into the white zone. 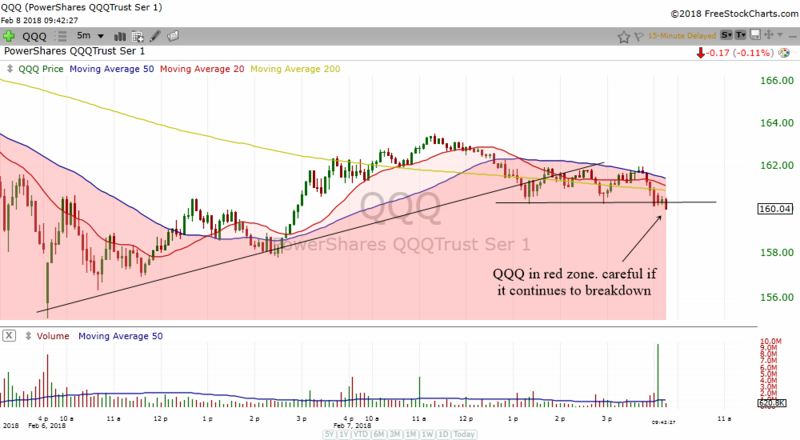 QQQ is below in the red zone now and if it breaks the support line, it will have a drop. You want to be extra careful of the drop and be bearish till it goes back into the white zone. 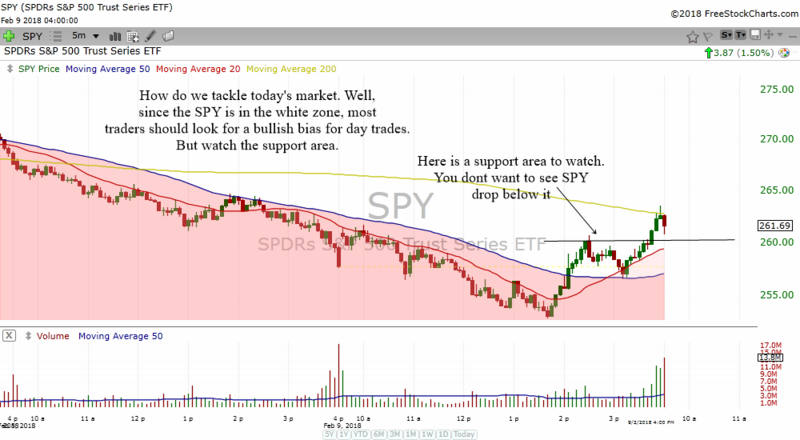 The chart above is the daily chart of SPY. It formed a topping tail yesterday. 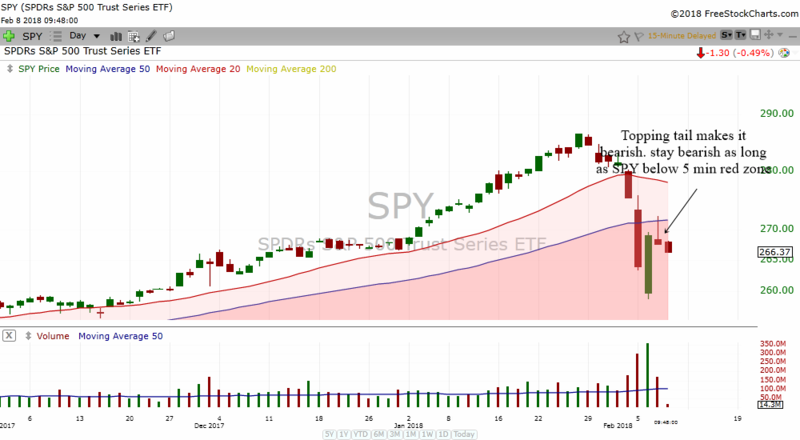 A topping tail is usually a bearish pattern and therefore people who see it will not be that bullish about SPY at the moment. 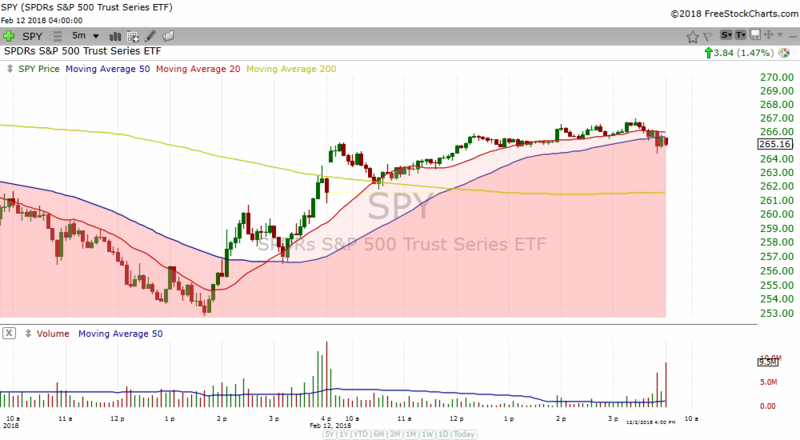 You have to be bearish on the general markets till the SPY goes back above the 5 min chart's red zone. 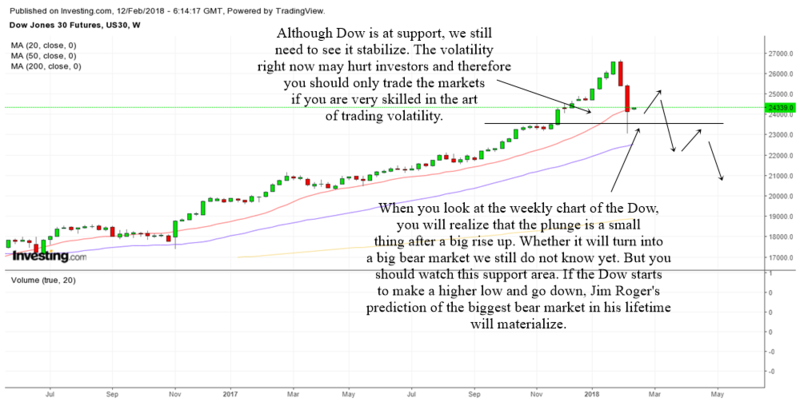 February 7 2018 (Wednesday) : Will The Rebound Sustain Or Will Dow Sink Lower Again? I think you must be feeling extremely excited with the wild movements in the Dow, S&P and Nasdaq. We truly had a very very frightful drop and quick and fast bounce up. Despite the brilliant bounce up, many investors are still nervous. I think it will still take some time for the markets to stabilize, so we might have some volatility ahead for the next few days to weeks. The reason why we should expect volatility is because of the unusually huge drop that Dow has experienced. Usually from my experience, this kind of a drop rarely goes back straight up to the former highs. It will need lots of zig zags here and there because generally everybody from your butler to your uncle to your grandmother is still pretty shocked from the flash drop in Dow. 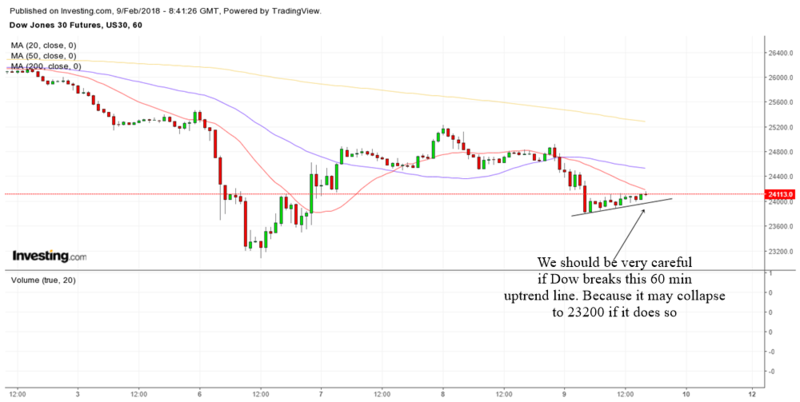 So, which is why ideally I want to see a double bottom or a triple bottom or a cup with handle or some zig zags that will eventually allow the Dow to break a nice downtrendline to go higher. 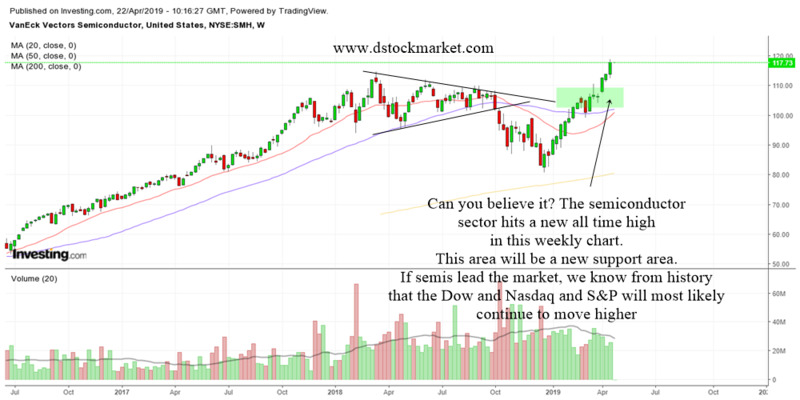 I do not know...nobody really knows what is the exact direction Dow will take but we will continue to do a bar by bar analysis everyday. 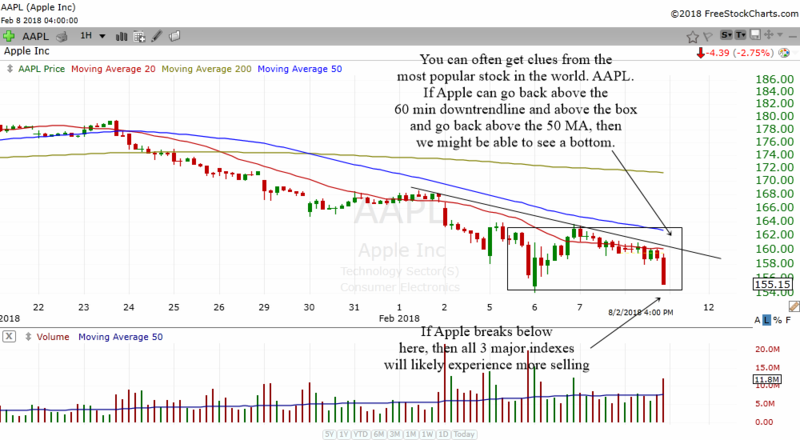 I just want to show you an example using the chart of Apple. This is a weekly chart by the way. 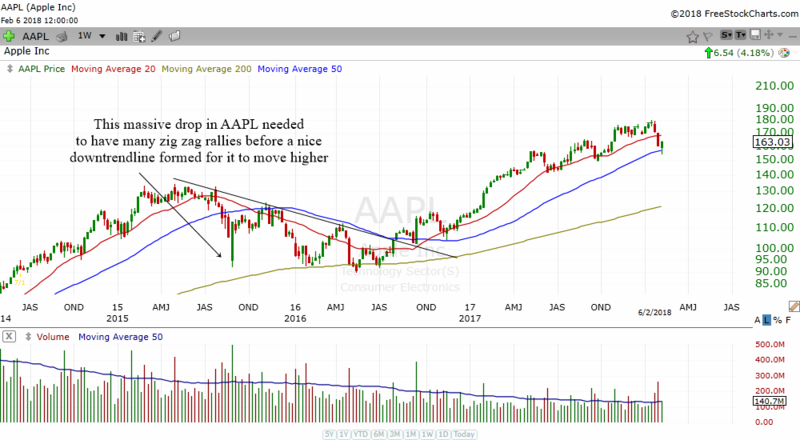 Notice the massive drop in Apple needed a very long time and many zig zags to form before it created a nice downtrendline for Apple to break back up higher. 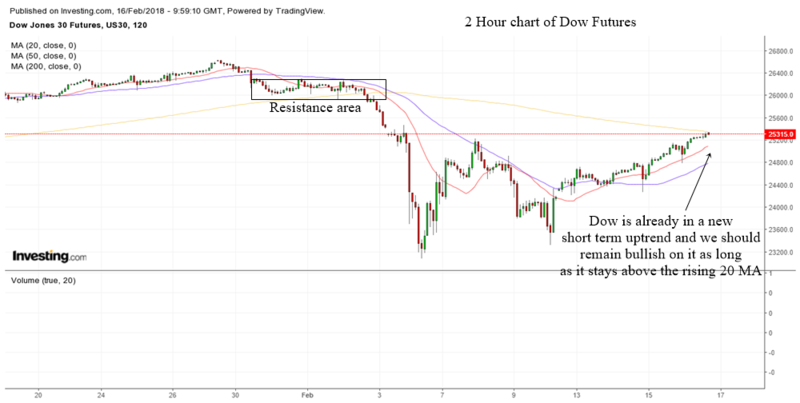 The chart above shows the 60 min chart of Dow futures. 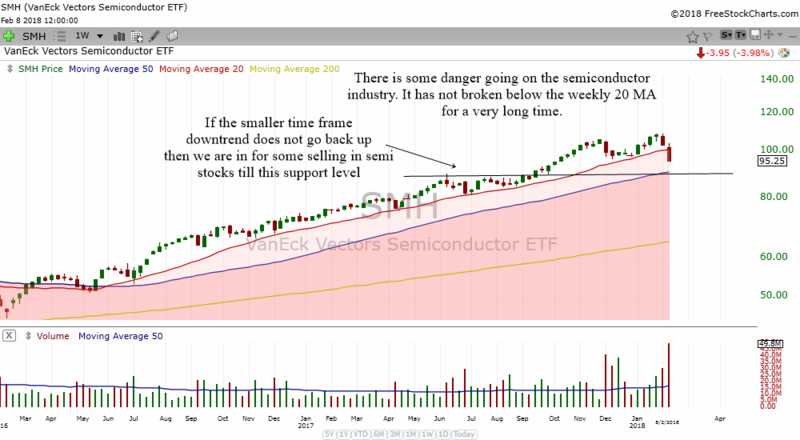 So far it is staying above the support line. Drifting sideways. It has broken the utprendline a bit but that's ok. But the problem will start if the support area cannot hold. Then Dow will likely resume the selling. 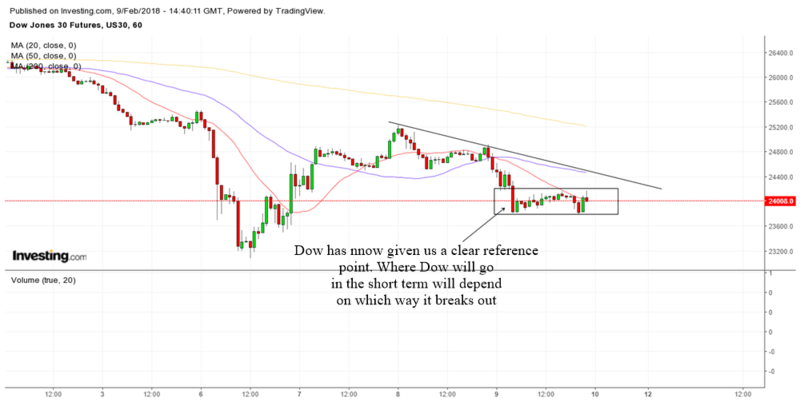 If Dow can trade sideways and rest, it might be able to breakout higher later. 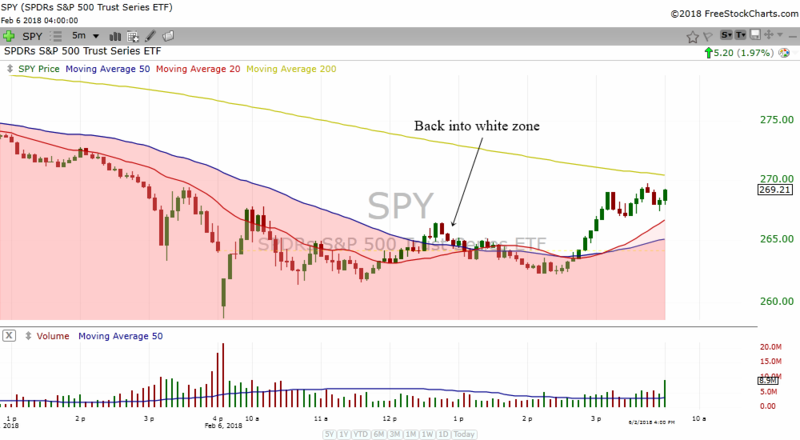 The 5 min buy sell signal chart shows us that SPY has traded back above into the white zone after being in the red zone for so many days. This was enough to help send many stocks higher for a nice day trade. 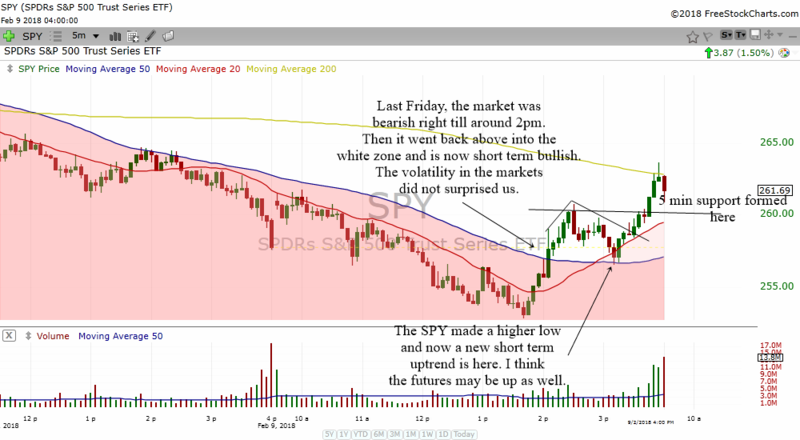 I think the futures are down so at the openings, the SPY will most probably be back into the red zone. 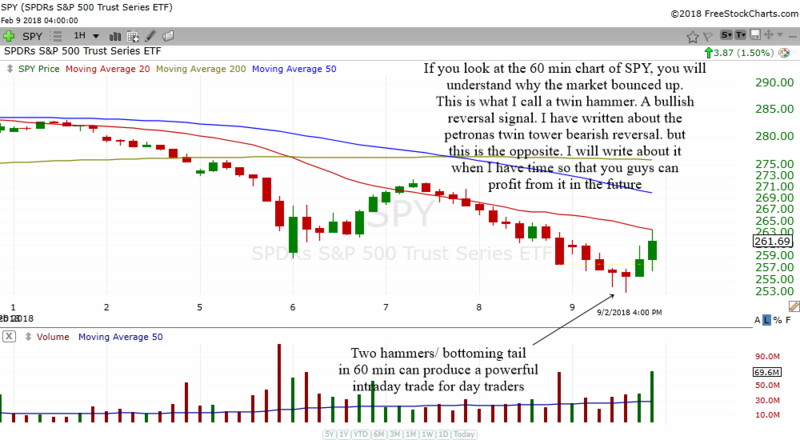 The 5 min chart is useful for traders to know when is conducive to buy or sell for day trades. At this moment, the major indices are at crucial support areas. Usually this is a place to expect some bounce up. I have written an article on it which you can find at Investing.com. 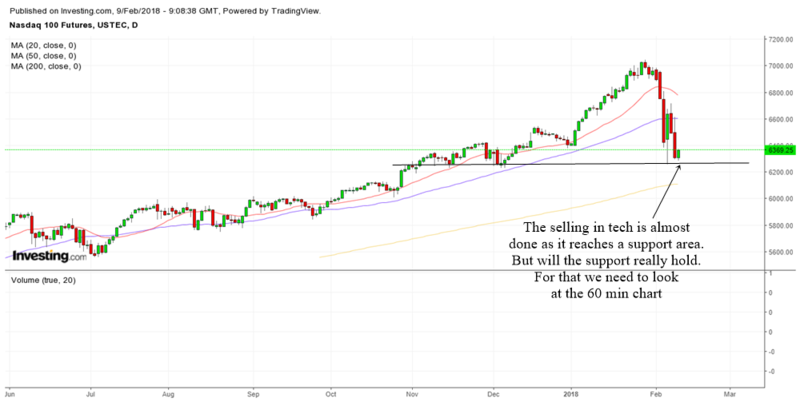 When Will The Panic Selling In The Stock Market End? Despite having a support areas, the overall negativity of the whole stock market needs to be taken into account. Yes, support areas can be potential areas to bottom fish and to find reversals. But you also need to take into account the psychology of investors and traders who lost a lot and a lot of money. Any small weakness and the inability of support levels to hold will send the indices selling down even more and shocking lots of people. If you are a regular reader in my US Market Trading Telegram Group you will realize that I like to use red zones and white zones in the 5 minute chart. Red zone means you should not buy stocks and white zone means you can buy stocks. Red zones also mean it is conducive to short stocks. This is just a simple trend following method to keep us on the right side of the market. The area below the 5 min 50 MA is the red zone. I have just colored it so it is easy to see. 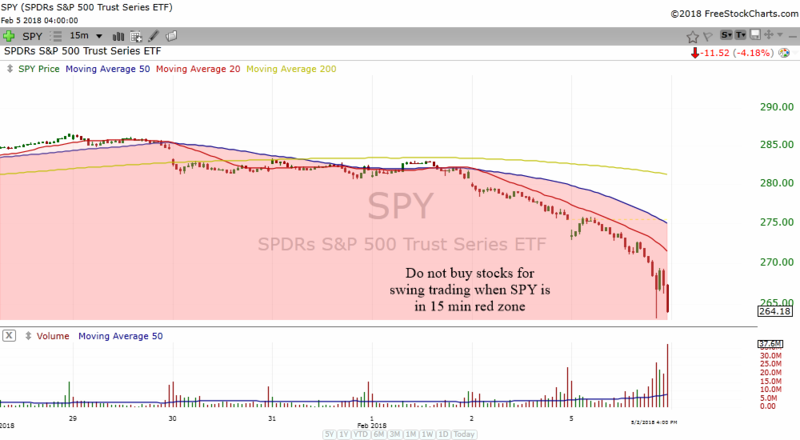 Do not attempt to buy stocks if the SPY is still in the 5 minute chart red zone. I hope I make that clear. You should be patient and wait for things to stabilize first. 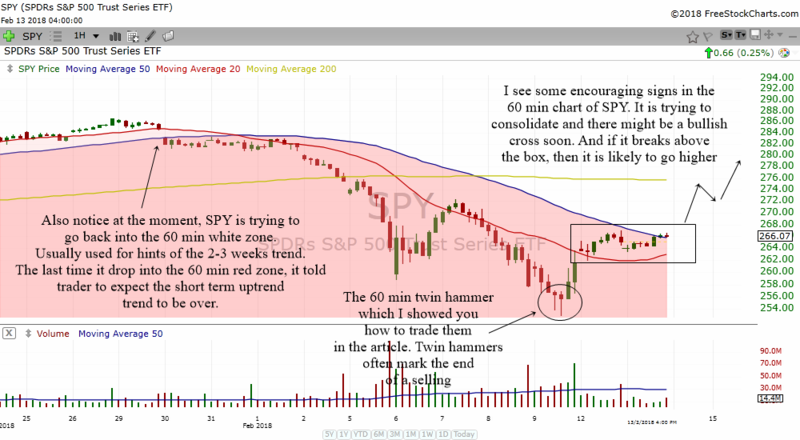 The chart above is the 15 min chart of SPY. I have colored the area below the 15 min 50 MA red. 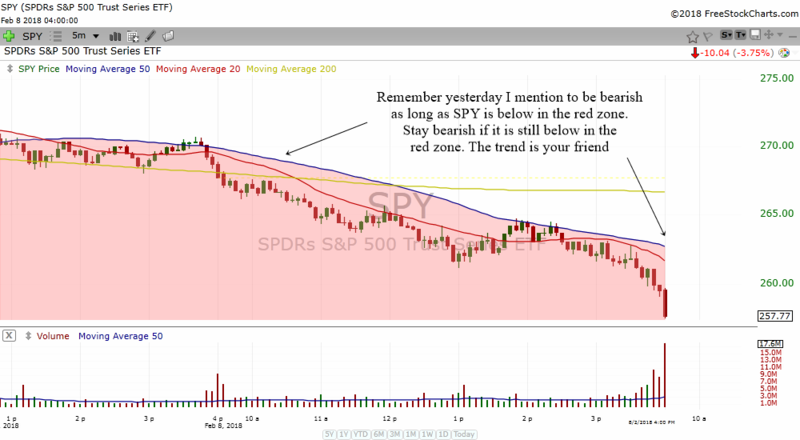 The general rule is, things won't be good for swing trades or trades that last a few days if the SPY is in the red zone. This simple trend following method using the 5 min red zone and 15 min red zone is not foolproof. But at least it will keep you on the right side of the market most of the time. There are some trading strategies that don't need these filter at all but most stocks wont be doing that well when the SPY is in the red zones in both of these time frames. Despite the major indices are at support, nobody really knows whether the support will hold or another wave or selling will happen. You need some kind of filter to tell you when it is conducive to buy stocks and when it is conducive not to buy stocks. I have found the red zones to be very helpful and I certainly hope they will be helpful to you too. The chart above is the daily chart of the Dow Futures. As you can see, the Dow is falling to a price support area and the rising 200 MA. 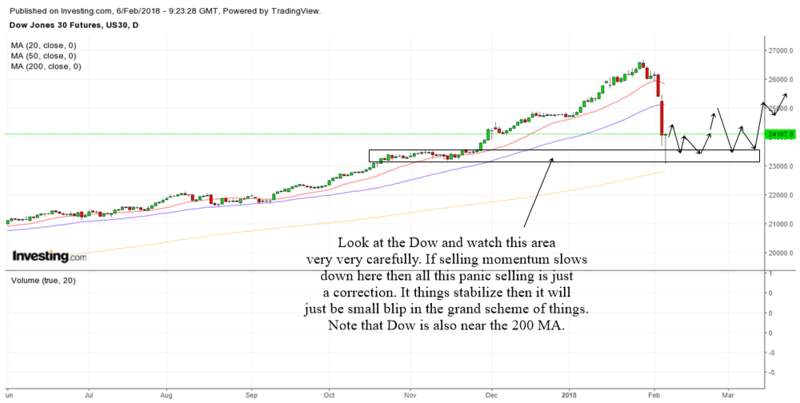 Just because the Dow is falling to that area of support it does not mean you should get your guns out and shoot to buy all stocks. You need to see price stabilize first especially after 2 big red bars. 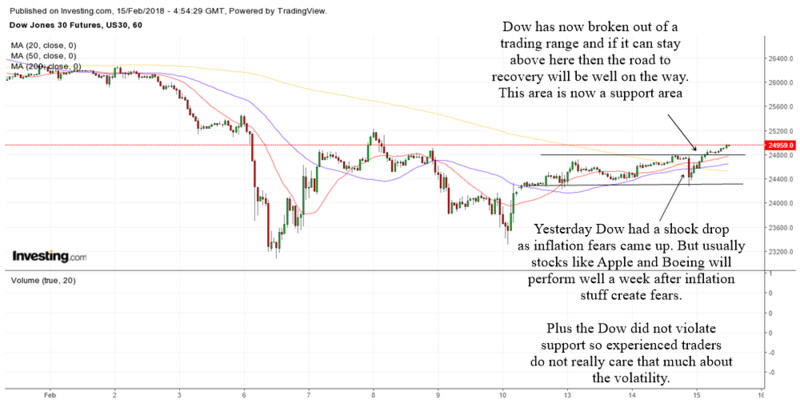 The chart above is the 60 min chart of Dow Futures. What you do not want to see is for Dow to consolidate and then break lower. The consolidation will act to absorb the support. A breakdown below the consolidation will cause the market to panic and send the Dow lower. The daily chart of SPY, DIA and QQQ is not very encouraging at the moment. All 3 of them have broken a daily uptrend line. 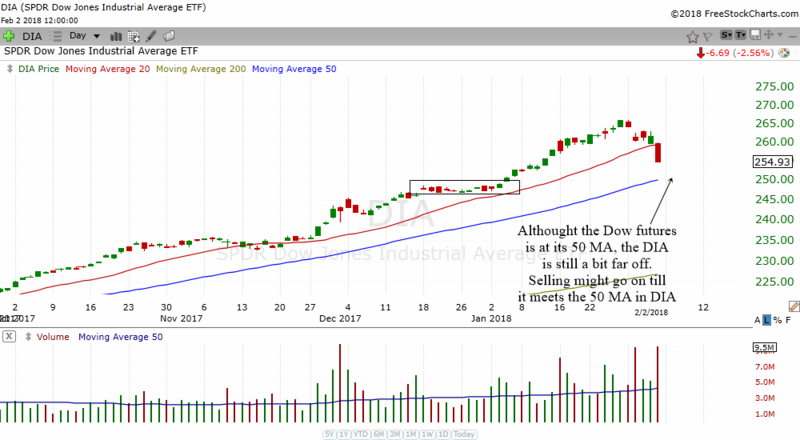 While the futures are near their 50 MA, the 50 MA for SPY, DIA and QQQ is a bit far and if the 60 min charts do not show any sign of slowing momentum then there might be more selling. 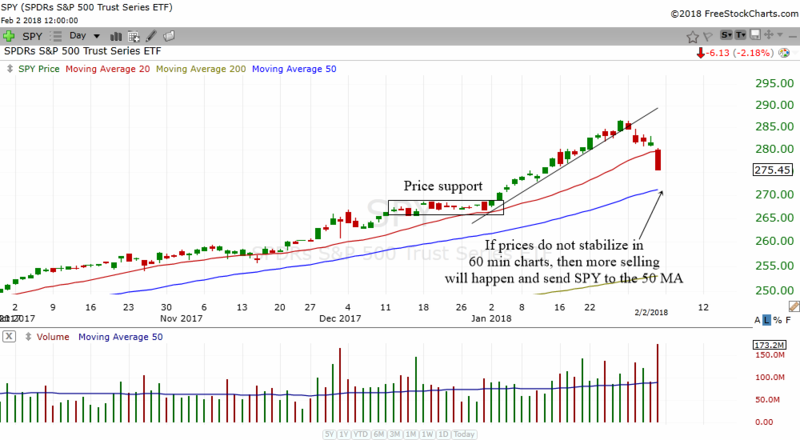 Price support for the SPY is still a bit far away. Same story for the DIA. 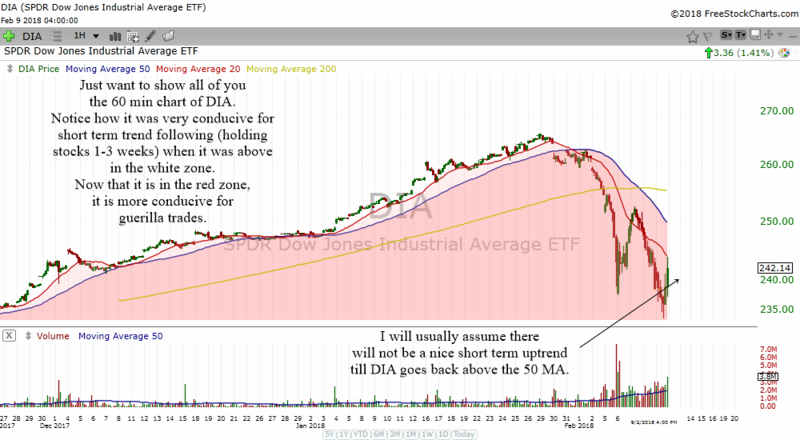 Price support and the 50 MA for DIA is much further than the Dow Futures. 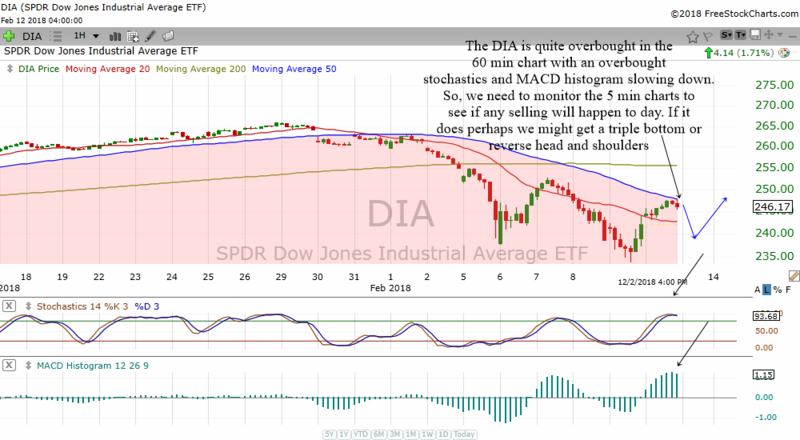 Selling might go on till it meets the 50 MA in the DIA. Trying to catch the bottom and where selling might end takes some patience. One should not jump in too fast as when a correction happens it could go on and on and on. Therefore, it is advisable to slowly monitor what is happening. The daily chart of QQQ also looks very overbought. It sliced through its 20 MA, broke an uptrend line and if the 60 min charts do not stabilize, we can expect more selling even down to 160. The chart above shows the 60 min chart of QQQ. 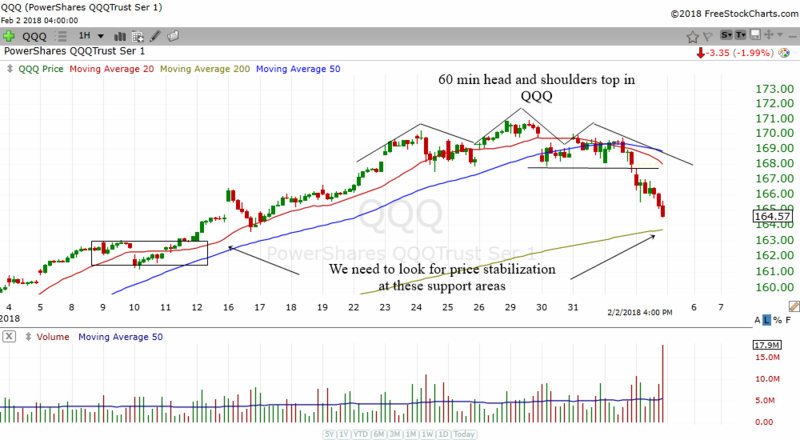 As you can see the QQQ has already formed a 60 min head and shoulders top. It break below the neck and the selling started very fast. 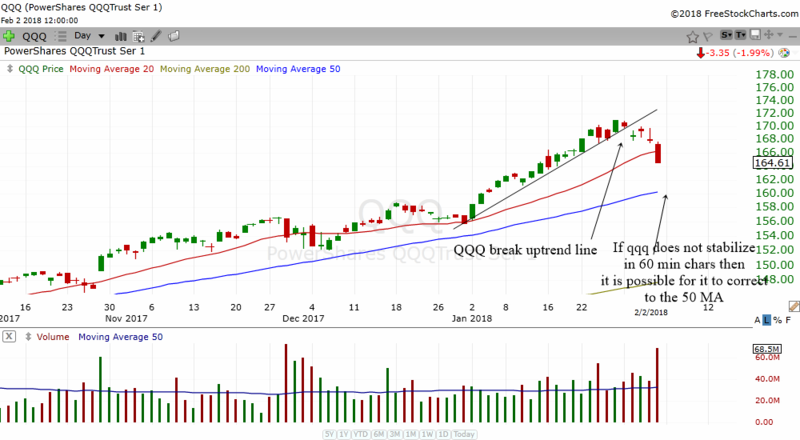 QQQ is selling off to the rising 200 MA and it is at this area as well as the support area that we need to see it stabilize. If it cannot stabilize, we can expect more selling in tech stocks. 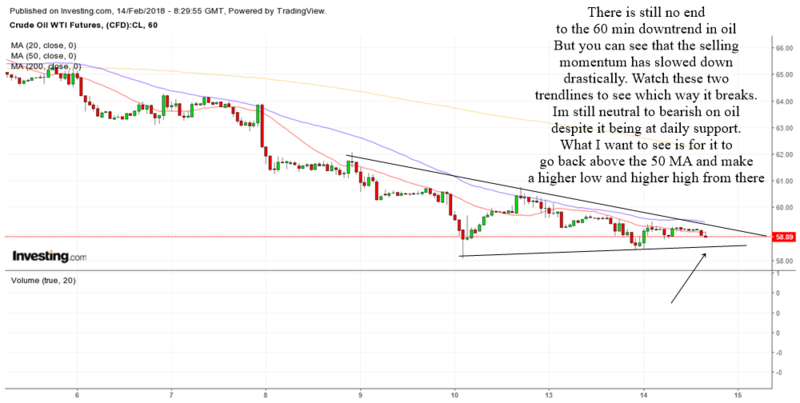 So far, the 60 min trend is down and it is still very dangerous to long stocks. 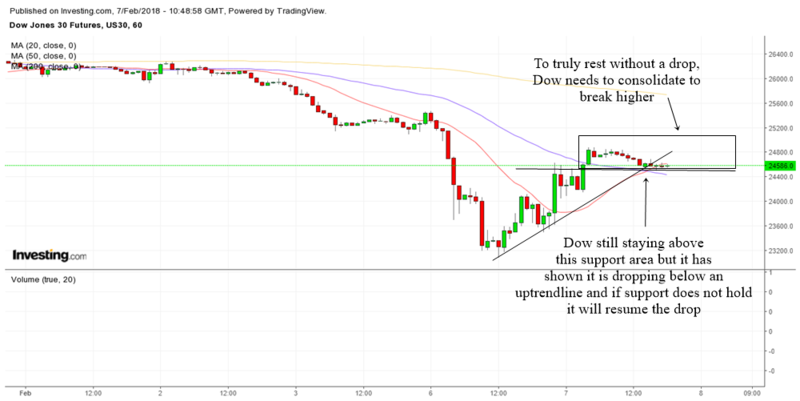 I just had a look at the 60 min chart of the Dow futures and I can see that the 15 min ascending triangle I show you below is not working out very well. 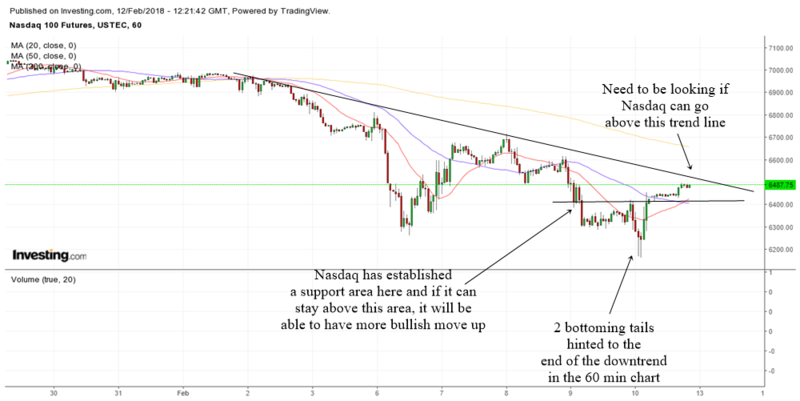 If Dow continues to break the uptrend line in the 60 min, we can expect more selling. I expect the index to remain weak unless it manages to go back above the rising 20 MA. 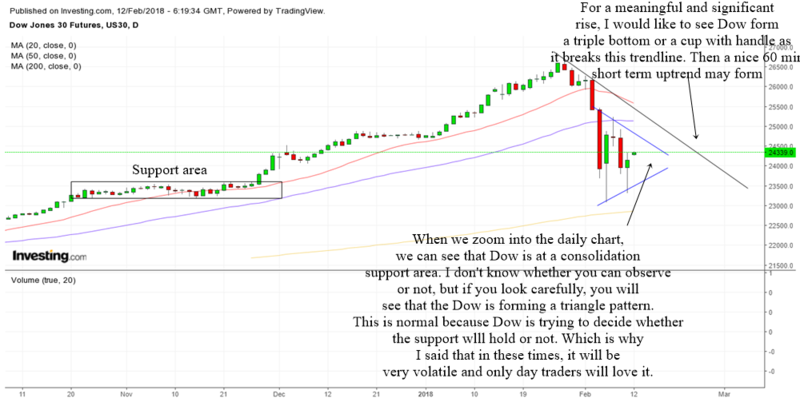 The daily chart of the Dow Jones shows how much it has suffered. The index sliced through its rising 20 MA and this is something to be concerned about. The last time it touches the rising 20 MA, the index tends to stop dropping and then rises again. Looks like the Dow is no longer respecting its rising 20 MA. The other thing that I do not like is the big red bar. A big red bar is a picture of negativity. 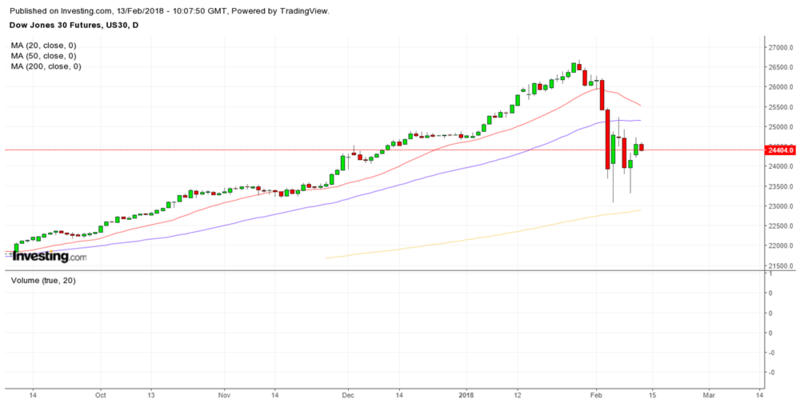 If the index drops gradually to the rising 50 MA, then it is a great time to buy the dips. On the other hand, a big red bar is quite problematic. For that I prefer to see a doji today or some bottoming tail form to give me a clue that the short term selling momentum has slowed down. The Dow is dropping to 2 very significant areas. 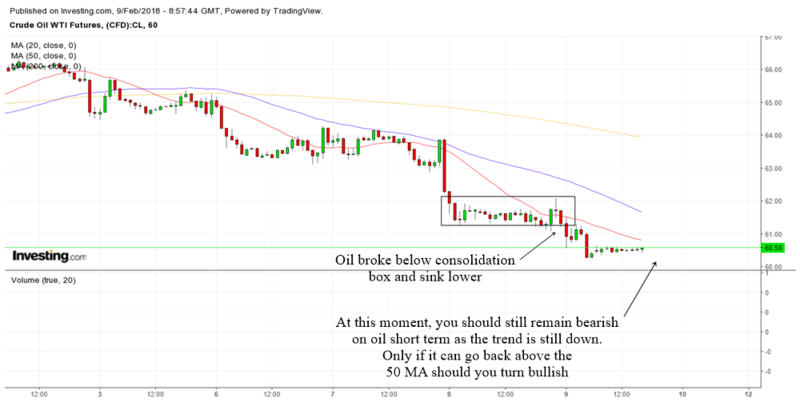 To see a bounce up and reversal, we need to look at the smaller time frames such as the 60 min chart or the 15 min chart to spot and bullish reversal patterns. 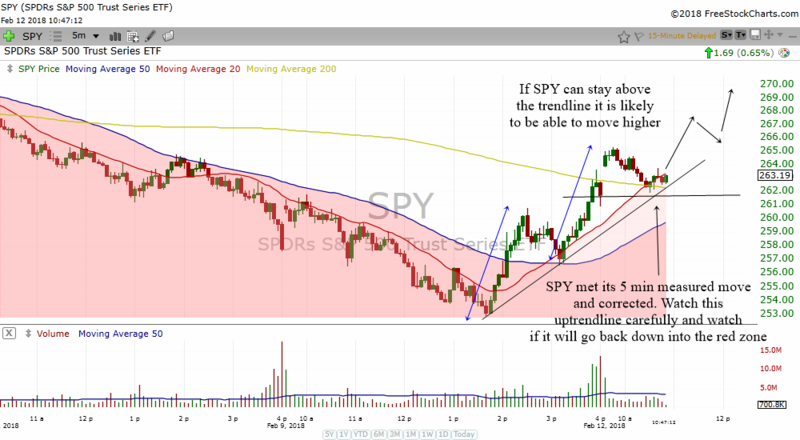 If the daily 50 MA cannot hold, then the index will drop to the price support area. 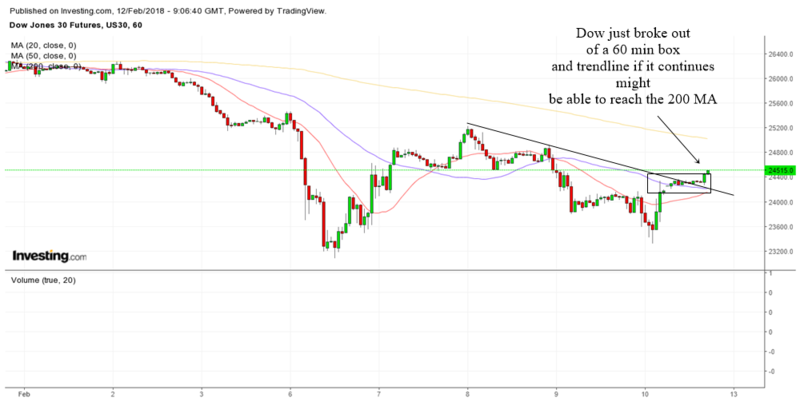 To gauge whether the bounces can help Dow resume its uptrend, we need to see Dow break above a downtrend line which I have drawn on the chart. The breaking of the trend line will tell us that the move up in Dow is sustainable. 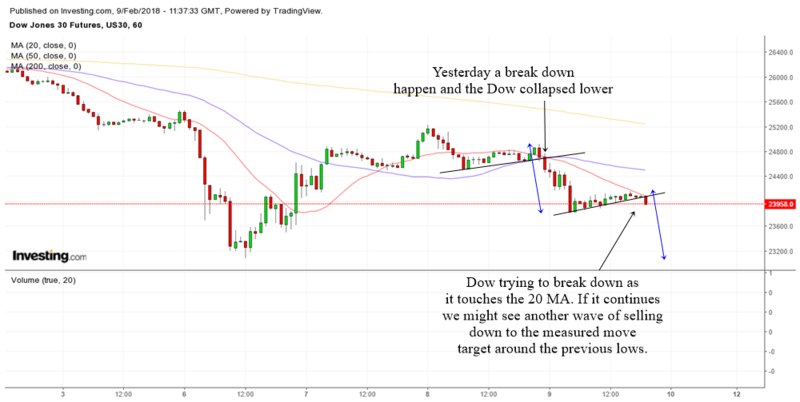 The above is the 15 min chart of Dow. If it can break above the ascending triangle pattern and go higher then we might experience a bounce. If not, we can expect more selling in Dow.